This recipe was partly inspired by a recipe for a beetroot, carrot and bean slow cooker casserole from Sara Lewis’ Ultimate Slow Cooker cookbook. The remaining “inspiration” was more like desperation when I needed to come up with some sort of dish to take to a pot luck dinner and the fridge was fairly bare apart from plenty of beetroot and carrots. A salad was thrown together and turned out to be one that the family voted a ‘make again’. It has been through several tweaks and trials and each has been a success with a different member of the family. So it can be changed according to what you have available: use brown onions instead of red and green or savoy instead of red cabbage. The cabbage can be lightly steamed instead of raw and the green beans left out completely or swapped for another green vegetable such as broad beans or broccoli. The amount of dressing is enough to coat the vegetables and it can be incorporated before serving. Omit the garlic aioli if desired (or use mayonnaise instead) although I like the slight tang it adds to the dressing. 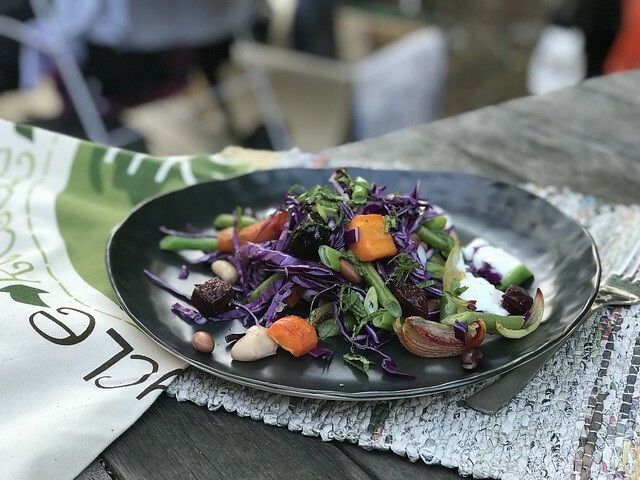 The salad is filling enough to be served as a main course and any left overs are perfect for lunch the next day. Peel the red onion and cut in half width-wise, then cut each half into 8 wedges. Peel or scrub the beetroot and cut into bite sized pieces. Peel or scrub the carrots and cut into bite sized pieces (the cut vegetables should all roughly be the same size). There should be about 3 cups of beetroot and 3 cups of carrot. Place the prepared vegetables into a large roasting dish – to keep the beetroot from colouring all the carrots, place the beetroot at one end, the carrots at the other and the red onion in between. Season with salt and freshly ground black pepper then drizzle over the olive oil. Give the pan a shake to settle the vegetables into an even layer then roast at 200C for 30 minutes. Stir (adding a little more oil if required), then roast again for a further 15-20 minutes until the vegetables are cooked. While the vegetables are roasting, prepare the remaining ingredients. Finely slice the cabbage, as if cutting for coleslaw (there should be about 3 cups). Rinse the tinned beans and drain well. Lightly steam the green beans until just cooked. Slice the spring onions and mint leaves finely. To make the dressing: mash the feta with a fork. Scrape it into a bowl, add the yoghurt and whip the ingredients together with a fork. Add the dip and aioli (if using) and stir to mix the ingredients together well. Pile the cabbage and beans onto a large serving platter. Add the roasted vegetables and lightly toss the ingredients together. Sprinkle with the spring onions and mint leaves. Serve the dressing alongside. 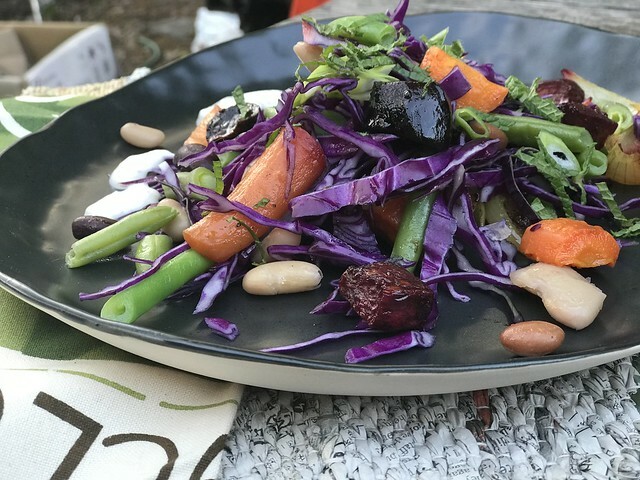 This entry was posted in Salad, Savour, Spring and tagged beetroot, carrots, Cucumber & Yoghurt Dip, green beans, red cabbage by Jo Dohrman. Bookmark the permalink.